In the ‘60s a major discovery was made from soundings of seafloor depth using doppler radar from ships plying the oceans of the world. A 40-thousand milelong mountain chain was found on the bottom of the ocean extending around the globe like a seam on a baseball. It was apparently formed from hot magma being extruded from the earth’s crust into the ocean, cooling, and hardening into solid rock. Based on this evidence the Plate Tectonics Theory was developed. It is now routinely taught in almost all graduate programs in geology. 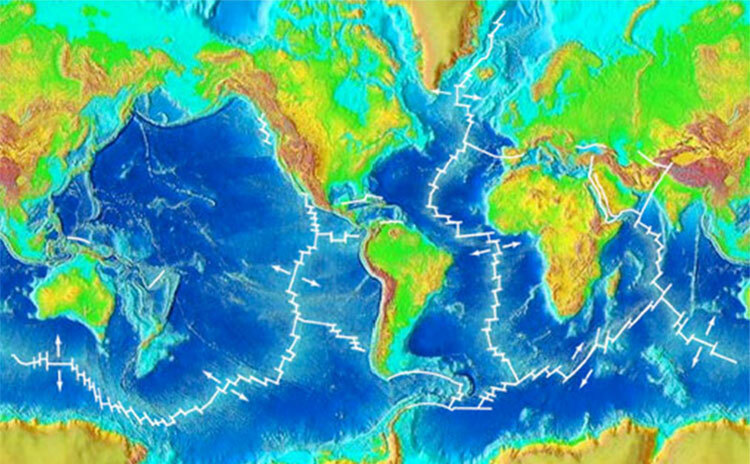 The theory argues that the crust of the earth is composed of numerous plates separated by cracks through which the magna flowed onto the ocean floor. These plates are measuredto be moving slowly across the planet at about the rate of centimeters per year—the approximate rate at which fingernails grow. Along and either side of the cracks between the plates most of our active geology is currently occurring, for example, earthquakes, volcanic eruptions, and mountain building. Conventional geologic earth history is built around the conventional plate tectonic theory including the millions of years necessary for evolution to occur. However, in 1994 a new model of earth history called Catastrophic Plate Tectonics was introduced to the young earth creationist community by Steve Austin, John Baumgardner, Andrew Snelling, Larry Vardiman, and Kurt Wise. It has the advantage of explaining the current and historical observations of earth motions and topography in a young-earth time frame and is consistent with the biblical account of the Genesis Flood. In addition, the heat released by the magma into the oceans provides an excellent explanation for the cause of the ice age.